In the past few weeks I’ve noticed that our family has really started looking forward to the weekend. We’re a bit grumpy on Mondays, tired on Tuesdays, drained by Wednesday and we just muddle through Thursdays. But then when Friday comes along it’s a party! Our weekends are reserved for all the fun family stuff, and we have a wonderful time. But it got me thinking, why don’t we celebrate more during the week? Why can’t a simple Wednesday be a family fun night too? So this past week I decided to make a change and have a fun party night on a weeknight. I planned a Pierogi Party on a Wednesday! I hadn’t made my son pierogies in forever and my daughter had never had them. But what better kid food is there than mashed potatoes in a small dumpling? The pierogi party was so much fun and really easy to do. I just bought several boxes of Mrs. T’s Pierogies in different varieties. Then I planned some different toppings that I knew we would all love. First I made some Pizza Pierogies. 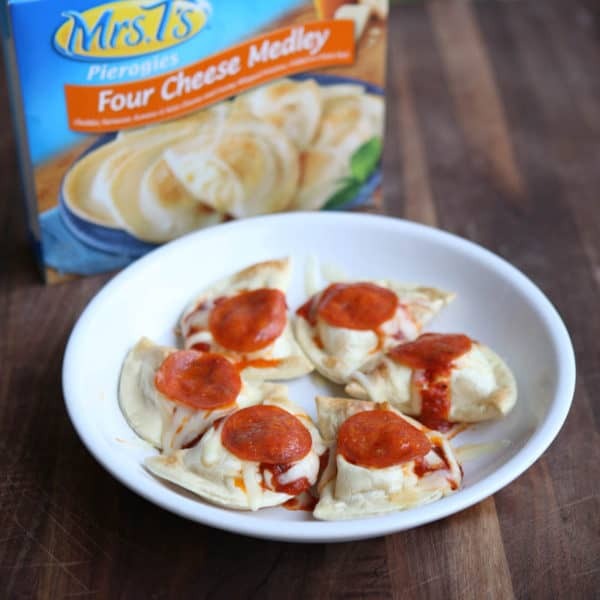 For these I used Mrs. T’s Pierogies Four Cheese Melody, but their new Mozzarella Tomato and Basil pierogies would be amazing too. After I baked them according to package directions, I placed them on a plate and then topped them with pizza sauce, mozzarella cheese and pepperoni. Then I placed them back in the oven, just long enough for the cheese to melt. These were my kid’s favorite, of course! Next I made some Florentine pierogies. 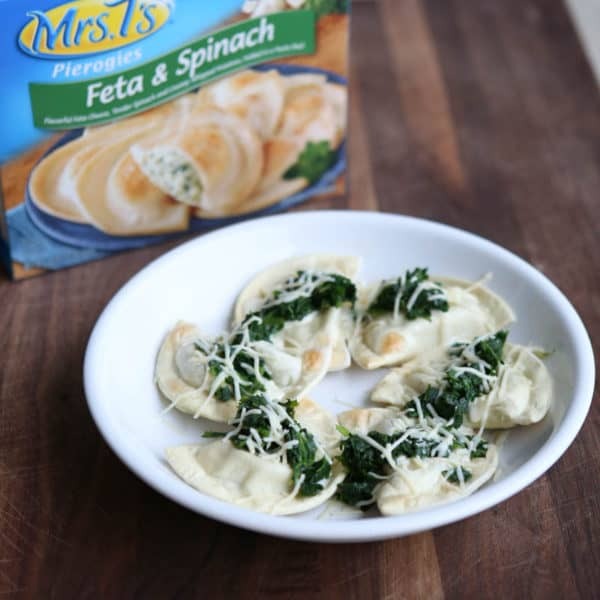 For these I used Mrs. T’s Pierogies Feta and Spinach. After baking them I topped them with Alfredo sauce, frozen and defrosted spinach, and parmesan cheese. These were so delicious and a great way to get the kids to eat some more healthy spinach. For the last ones, I made French Onion Pierogies. 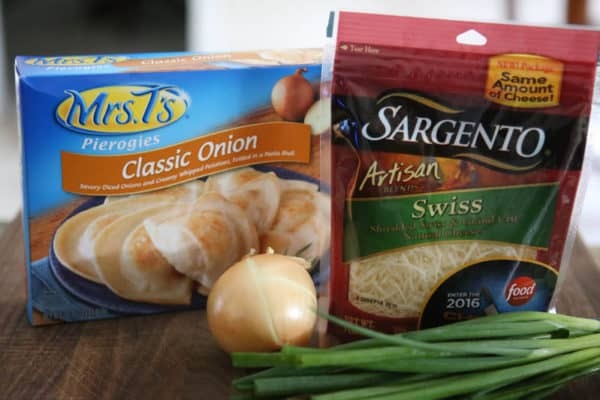 I started with Mrs. T’s Pierogies Classic Onion. Then I topped these with caramelized onions and Swiss cheese. I was going to garnish these with green onions too, but my family just couldn’t wait! These were my personal favorite. The sweetness of the caramelized onion was so good! These pierogies were so much fun to make with my family. After I baked them, my son helped add the toppings. Both my daughter and son loved them! They were perfect for my daughter’s little hands and made the perfect soft food for her. They were such a big hit, I can’t wait to make them again next week! 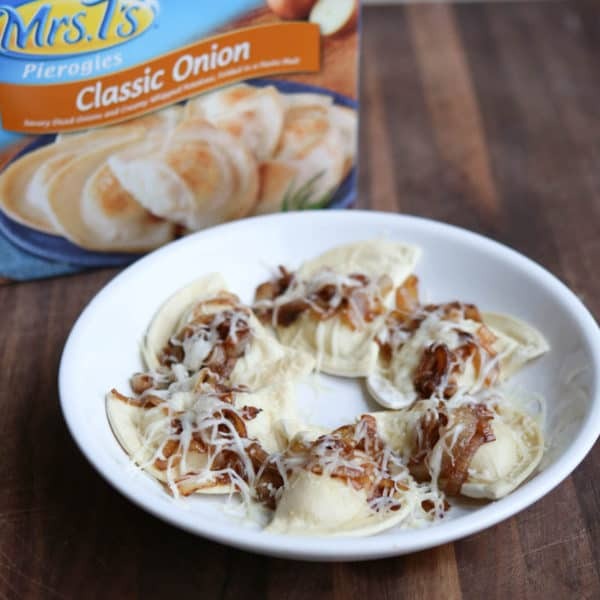 You can find Mrs. T’s Pierogies in your local grocer’s freezer section. They come in many different and delicious varieties that your family is sure to love. These would make a fun and kid-friendly dinner any night of the week. according to package directions in the oven. Arrange 6 perigees on an oven safe plate and top with pizza sauce, mozzarella cheese and pepperoni. Place back in the oven and bake just until cheese melts. Prepare Mrs. T's Pierogiesaccording to package directions in the oven. 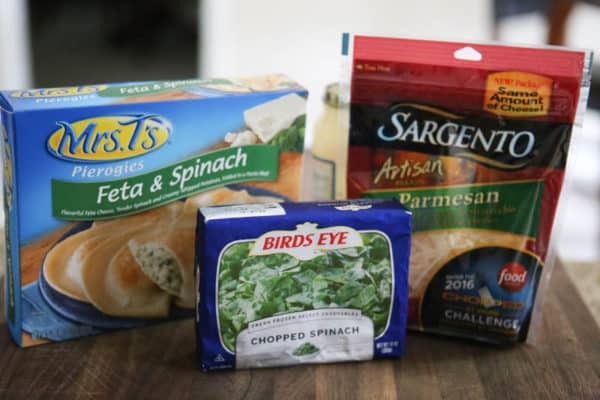 Arrange 6 perigees on an oven safe plate and top with alfredo sauce, spinach and Parmesan cheese. Place back in the oven and bake just until cheese melts. PrepareMrs. T's Pierogiesaccording to package directions in the oven. Add sliced onions and olive oil to a medium skillet and sauce over low heat for 15 - 20 minutes, or onions are caramalized. Arrange 6 perigees on an oven safe plate and top with caramelized onions and Swiss cheese. Place back in the oven and bake just until cheese melts. 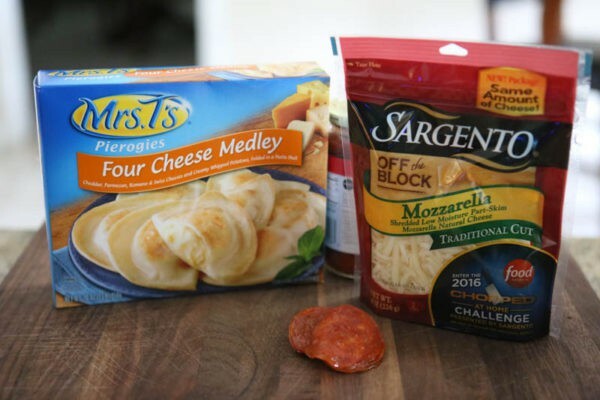 You can find this and many more options in the freezer aisle that make weeknight family dinners easier and faster to make. That way you can spend more time with the family, and less time prepping and cleaning up in the kitchen. The frozen and dairy section of your local grocery store is where you can find lots of inspiration to create simple family-friendly meals like this one. A pierogi party! What a fun idea. My kids would love this. How fun does a piergi party sound?